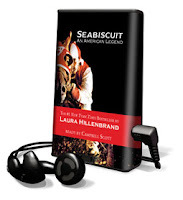 I love audiobooks and I listen to them all the time on my field digital audio recorder, downloaded from audible.com. However, because of the tech hurdle, they tend to miss one of their most important audiences: older people who use computers rarely or not at all, but who would welcome the audible version of a story. My aunt is a case in point. She does not read anymore because of her eyesight, but that exempts her from a computer as well. She isn't just unlikely to download something -- the act is impossible for her. So audible.com and its ilk are out, even though she has the potential to be a good user. Her grandsons might be able to load audiobooks onto an iPod for her, but she won't work the little buttons and she'll get confused about where she is in a book... she needs a large, easy interface. A company called Playaway has a solution she might actually use. It's a device somewhat shaped like a book and marked like one, with large buttons and a headphone. You put on the headphones and press play. Instead of touting how many of the little suckers you can stuff onto one memory device, this is the opposite: one book per. It is admittedly expensive at about $40 per title, but on the other hand, it's the only way she's going to use audio, so it might make sense for her public library that serves many seniors.